For the cover of his latest book, the bestselling scientist and engineer Mark Miodownik chooses an art piece by Katrin Fridriks. The work of Circle Culture’s exhibited artist Katrin Fridriks is highly regarded in the world of science. After being featured in the article “Arts based research for sustainability” by German Professor Harald Heinrichs in GAIA magazine, again the work of the abstract painter from Iceland was chosen in the context of environment and sustainability issues. 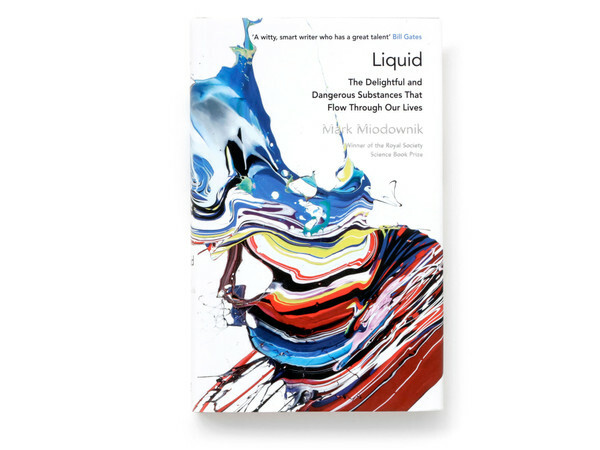 This time, her art piece “Noble & Awakening Force” adorns the book “Liquid - The Delightful and Dangerous Substances That Flow Through Our Lives” by Mark Miodownik. Honored by The Times as “one of the 100 most influential scientists in the UK”, Mark Miodownik is Professor of Materials and Society at University College London, where he is also Director of the Institute of Making. He is the author of the book “Stuff Matters”, a New York Times bestseller which won the Royal Society Winton Prize. His latest book “Liquid” is an expert tour of the world of the droplets, heartbeats and ocean waves that we come across every day. Structured around an airplane journey which sees encounters with substances from water and glue to coffee and wine, he shows how these liquids can bring death and destruction as well as wonder and fascination. In doing so, Miodownik shares Katrin Fridrik's unlimited curiosity in the four elements – air, fire, earth and water. Her paintings are best described as an occurrence, rather than a static image: The moment of eruption, liquid matter gushing from deep inside, small particles hurtling through the air, dripping all over the intense blue, red or silvery surface, all solid is liquefied and each layer set in motion. Therefore, it is no surprise that these two characters create such a wonderful collaboration.